Ray Bradbury spent decades refashioning many of his early pulp and mainstream magazine stories to form the intricate story-cycle tapestries of The Martian Chronicles and Dandelion Wine; other tales were revised or rewritten for such timeless collections as Dark Carnival, The Illustrated Man, The Golden Apples of the Sun, and The October Country. These volumes represent wonderful and enduring fictional masks for the author, but they are not his original masks. The Collected Stories of Ray Bradbury series returns to the earliest surviving forms of his oldest published tales, presenting many of them in versions not seen since the 1940s and early 1950s, when the Golden Age of the American magazine began to pass into history. The restoration of these texts is a scholarly enterprise, including searches through long-lost typescripts, hundreds of elusive magazine issues, and thousands of textual variants, seeking to restore the author’s earliest intentions for his first published stories. Jonathan R. Eller’s textual commentaries document the history of the composition and publication of the stories—and Bradbury’s emerging understanding of genre fiction—from their original forms to the versions best known today. 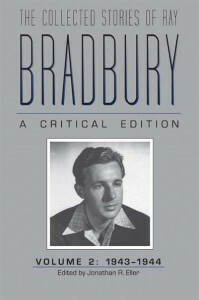 The second volume of the proposed eight-volume edition includes twenty-five stories written between April 1943 and March 1944, and it contains eight stories that Bradbury never placed in his own story collections. These tales document an incredibly productive year that saw the twenty-threeyear-old writer move ever closer to becoming a masterful teller of timeless stories. For many of them, the original serial forms recovered in this volume differ significantly from the versions Bradbury popularized in his subsequent collections. For three of these stories, the original typescripts survive, making it possible to establish the critical text directly from the author’s unstyled spellings and punctuation. By documenting the way the stories evolved over time, Eller reveals crucial new information about Bradbury’s maturing creativity and poetic prose style. EditorJonathan R. Eller is Chancellor’s Professor of English, director of the Center for Ray Bradbury Studies, and senior textual editor of the Institute for American Thought at Indiana University–Purdue University, Indianapolis. He coedited Volume 1 of The Collected Stories of Ray Bradbury with founding editor emeritus William F. Touponce, with whom he also coauthored Ray Bradbury: The Life of Fiction (The Kent State University Press, 2004). Eller is author of Becoming Ray Bradbury and Ray Bradbury Unbound (forthcoming), extensive studies of Bradbury’s early and middle career.